Leadership means – to guide or to influence into an action. In today’s highly competitive world, it becomes important for organizations to have a good leader. The well-known book “In Search of Excellence” concludes that every company that has maintained its excellence over the years has done so because it had ‘a leader or two’ who gave it its structure. This conclusion has since been reinforced in a recent study by the Stanford Research Institute. It concluded that “12 per cent of effective management strategy is knowledge and 88 per cent is dealing appropriately with people”. Indeed, dealing appropriately with people is Leadership. We know instinctively that in every human activity involving a group of people, there is a need for the guiding hand of a leader. The head of a family is the most ubiquitous leader since the dawn of human history. It is well accepted that on the quality and effectiveness of this leader, be it father or the mother, depends the progress and fortunes of the family. In the modern complex society thousands of individuals are appointed or elected to shoulder roles and responsibilities of leadership in junior, middle and senior levels in factories and farms, schools and colleges, business and financial institutions, dispensaries and hospitals, in civil and military organs of the State’s scientific and research institutions and so on. On their quality and effectiveness depends the strength, prosperity and happiness of society. In history an effective leader has always been a ‘force multiplier’. Leadership as the behavioural dimension helps in the successful implementation of the strategy. It is important to remember that leadership cannot be taught. However, a man does have the capability to perform himself/herself-to reprogramme his/her personality. And, it is here, that the most exciting part of human endeavour lies. Some researchers have shown that if the executives have good leadership qualities, the productivity of the nation can increase to a large extent without additional finance or new technology. It is important to note that the theoretical approach of leadership taught in classrooms is less effective than the practical approach. In the prevailing environment in India, it is often argued, that things can improve only if the top leadership in the country sets the right example. Alternatively, the educational system should be reformed so that slowly perhaps in 50 years, things may improve. Both the views do have some theoretical merit: but do not appear to be practical. Consequently the only way is to find a method of improving the leadership potential of those already shouldering responsibilities and of those who are getting ready to enter the field of leadership in any walk of life. This is the basic philosophy of the practical and holistic approach to leadership—‘it is perfectly possible to improve myself; I can hope to improve others only by personal example’ is its message. Consequently the key to effective Strategic Management is to ensure that leadership runs like a uniform thread through all functions of management to integrate them into a culture of excellence. One of the primary needs for effective strategic management is to understand, in practical terms, the meaning of leadership, its functions; and, finally to ensure that effective leaders are groomed and developed at every level in an organization. Only then will strategic managers be able to conceive strategic plans and translate these plans into reality. However, when it comes to evolving a definition or a theory of leadership we run into difficulties. “If we know all too much about our leaders, we know far too little about leadership—is it essentially inspiration? Is the leader a definer of values? Satisfier of needs? If leaders require followers, who leads whom, from where to where, and why? How do leaders lead followers without being wholly led by followers?” Leadership is one of the most observed and least understood phenomenon on earth. However, despite Maslow’s very perceptive diagnosis, almost a quarter of a century ago, an integrated view on this vital and age-old function in human society has not yet crystallised. Commenting on group dynamics laboratories Maslow observed: “What I smell here is again some of the democratic dogma and pity in which all people are equal and in which the conception of a factually strong person or natural leader or dominant person or superior intellect or superior decisiveness or whatever is bypassed, because it makes everybody uncomfortable, and because it seems to contradict the democratic philosophy (of course, it does not really contradict it)” (Maslow, 1965). Maslow made the above remarks as he was fully aware that there were serious reservations among intellectuals and scholars to the very concept of leadership. Ever since French revolution the academic community had assiduously tried to devalue leadership as it had got associated with aristocracy and feudalism and was thus regarded to be out of tune with the democratic ethos of equality. Equality of opportunity, which is the real sense of democract, somehow got extrapolated to equality of capability. It was overlooked that even two brothers with common heritage are not equal in their capabilities. Potential for leadership has no relation to parental stations in society. Many of the outstanding leaders in history had a non-affluent background. Ralph Stogdill, Fiedler, Hersey and Blanchard, have made useful contributions to understand various facets of this complex phenomena. A view that emerged in the late eighties is relevant to the study: “McClelland, Hall, Peters and Waterman, Jaques, Bennis—have been working on their parts of the puzzle. I believe that we are, however, ready to start assembling the parts” (Sashkin, 1989). It is time that we took a practical and holistic view of this ancient human capability on which depends the success or failure of strategic plans in any human activity. “Leadership is the capacity to frame plans which will succeed and the faculty to persuade others to carry them out in the face of all difficulties.” (Moran, 1984). The definition has two parts. The first deals with the capacity to frame plans (programmes, projects or whatever) that have a high probability of success. This implies that a plan should reflect a leader’s grasp and feel of the quality of his resources and the environments in which the plan has to be implemented. The second part of the definition deals with the implementation of the plan by persuading others to do what is really expected of them, despite difficulties, discouragement and obstacles. Indeed, it is this capacity which, as per the Stanford Research Institute, counts for 88 per cent of strategic management. The best and most realistic explanation is that management is a tool of leadership. The national bestseller during 1989-90 in the USA. “The 7 Habits of Highly Effective People” which is regarded as the handbook of leadership in the USA, has this to say about this correlation—Management is a bottom line focus. How can I best accomplish certain things? Leadership deals with the top line. What things I want to accomplish? In the words of both Peter Drucker and Warren Dennis ‘Management is doing things right; leadership is doing the right things’. Management is efficiency in climbing the ladder of success; leadership determines whether the ladder is leaning against the right wall”. In practical terms a leader has to achieve the task (mission, objective or goal). For doing so, s/he has to build his team as a cohesive group and develop every individual in the team to give his very best. Consequently, s/he has to harmonise and integrate the needs related to the accomplishment of the task with those of the group he leads and individuals in the group. 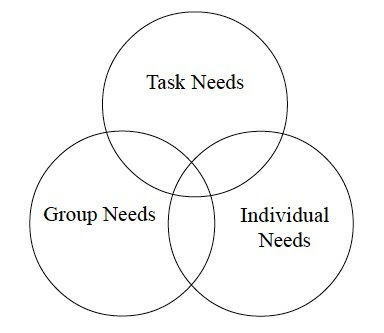 This is best explained diagrammatically by depicting these needs in three linked circles, as shown in Figure-1. Source: Adair, John (1973). Action Centred Leadership. The functions related to the needs of the three areas have been listed separately for easy understanding. In actual practice, however, most of these are integrated in the following steps : Planning to achieve the task by using the available resources and people Initiating work by allocating tasks and resources Controlling by monitoring the work; modifying plan Supporting by encouragement and by motivating and training Evaluating.